Once the first level of the Table of orders is filled with the customer orders, the Table splits into two symmetric tables of orders. 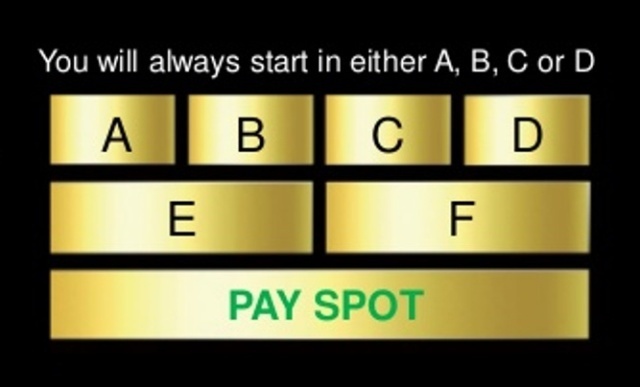 The order of the buyer moves down to the second level. At the first level of two new Tables of orders 4 new empty places are formed for new customer orders. As soon as the first level of START Table of orders fills up with 4 more new orders, the buyer's order moves down to the 3rd level. At the following table division, the buyer's order is charged with 260 Credit bonuses, which are used for the passage of the Customer's order to the Main Table of orders and under the condition of the qualification fulfilment the bonus remuneration in the amount of 60 credit bonuses will be charged. 6 credit bonuses (10%) will be deducted as the order processing fee. The investment gold bars are bought for the rest of 54 bonuses. After the full execution of the order, the customer passes to the START Table of Orders. If Owner of the order passed all three levels of Preliminary START table of orders, but didn't attract minimum two new or attracted only one order, his order will be withdrawn out of the Marketing Program and Company will refund him the amount, spent for the registration, i.e. 75 EUR to his internal Euro account. One point will be deducted from the Preliminary START table qualification of his superior sponsor.